Copyright © 2003 W3C® (MIT, INRIA, Keio), All Rights Reserved. W3C liability, trademark, document use, and software licensing rules apply. This document provides terminology for discussing language versioning, a number of questions that language designers must answer, and a variety of version identification strategies. A separate document contains XML language specific discussion. This document has been developed for discussion by the W3C Technical Architecture Group. It does not yet represent the consensus opinion of the TAG. Publication of this finding does not imply endorsement by the W3C Membership. This is a draft document and may be updated, replaced or obsoleted by other documents at any time. Additional TAG findings, both approved and in draft state, may also be available. The TAG expects to incorporate this and other findings into a Web Architecture Document that will be published according to the process of the W3C Recommendation Track. 1.2 Why Worry About Extensibility and Versioning? 1.3 Why Do Languages Change? 1.4 How Do Languages Change? 2.2 Why Have a Strategy? 3.2 Can 3rd parties extend the language? 3.3 Can 3rd parties extend the language in a compatible way? 3.4 Can 3rd parties extend the language in an incompatible way? 3.5 Can the designer extend the language in a compatible way? 3.6 Can the designer extend the language in an incompatible way? 3.7 Is the vocabulary a stand-alone language or an extension of another vocabulary? 3.9 Should extensions or versions be expressible in the Schema language? 4.1 Schema language design choices or constraints. The evolution of languages by adding, deleting, or changing syntax or semantics is called versioning. Making versioning work in practice is one of the most difficult problems in computing. Arguably, the Web rose dramatically in popularity because evolution and versioning were built into HTML and HTTP. Both systems provide explicit extensibility points and rules for understanding extensions that enable their decentralized extension and versioning. This finding describes general problems and techniques in evolving systems in compatible and incompatible ways. These techniques are designed to allow compatible changes with or without schema propagation. A number of questions, design patterns and rules are discussed with a focus towards enabling versioning in XML vocabularies, making use of XML Namespaces and XML Schema constructs. This includes not only general rules, but also rules for working with languages that provide an extensible container model, notably SOAP. The terminology for describing languages, producers, consumers, information, constraints, syntax, evolvability etc. follows. Let us consider an example. Two or more systems need to exchange name information. Names may not be the perfect choice of example because of internationalization reasons, but it resonates strongly with a very large audience. The Name Language is created to be exchanged. [Definition: A producer is an agent that creates text. ] Continuing our example, Fred is a producer of Name Language text. [Definition: An Act of Production is the creation of text.]. A producer produces text for the intent of conveying information. When Fred does the actual creation of the text, that is an act of production. [Definition: A consumer is an agent that consumes text.] We will use Barney and Wilma as consumers of text. [Definition: An Act of Consumption is the processing of text of a language.] Wilma and Barney consume the text separately from each other, each of these being a consumption event. A consumer is impacted by the instance that it consumes. That is, it interprets that instance and bases future processing, in part, on the information that it believes was present in that instance. Text can be consumed many times, by many consumers, and have many different impacts. [Definition: A Language consists of a set of text, any syntactic constraints on the text, a set of information, any semantic constraints on the information, and the mapping between texts and information. ][Definition: Text is a specific, discrete sequence of characters]. Given that there are constraints on a language, any particular text may or may not have membership in a language. Indeed, a particular string of characters may be a member of many languages, and there may be many different strings of characters that are members of a given language. The text of the language are the units of exchange. Documents are texts of a language. The Name Language consists of text set that have 3 terms and specifies syntactic constraints: that a name consists of a given and a family. [Definition: A language has a set of constraints that apply to the set of strings in the language. ] These constraints can be defined in machine processable syntactic constraint languages such as XML Schema, microformats, human readable textual descriptions such as HTML descriptions, or are embodied in software. 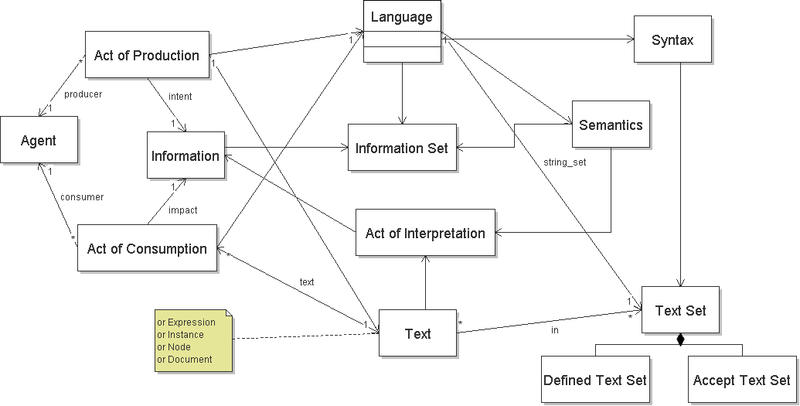 Languages may or may not be defined by a schema in any particular schema language. The constraints on a language determine the strings that qualify for membership in the language. Vocabulary terms contribute to the set of strings, but they are not the only source of characters to the set of strings in a given language. The language strings may include characters outside of terms, such as punctuation. One reason for additional characters is to distinguish or separate terms, such as whitespace and markup. The set of information in a language almost always has semantics. In the Name Language, given and family have the semantics of given and family names of people. The language also has the binding from the items in the information set to the text set. Any potential act of interpretation, that is any consumption or production, conveys information from text according to the language's binding. The language is designed for acts of interpretation, that being the purpose of languages. In our example, this mapping is obvious and trivial, but many languages it is not. Two languages may have the exact same strings but different meanings for them. In general, the intended meaning of a vocabulary term is scoped by the language in which the term is found. However, there is some expectation that terms drawn from a given vocabulary will have a consistent meaning across all languages in which they are used. Confusion often arises when terms have inconsistent meaning across language. The Name terms might be used in other languages, but it is generally expected that they will still be "the same" in some meaningful sense. Versioning is an issue that effects almost all applications eventually. Whether it's a processor styling documents in batch to produce PDF files, Web services engaged in financial transactions, HTML browsers, the language and instances will likely change over time. The versioning policies for a language, particularly whether the language is mutable or immutable, should be specified by the language owner. Versioning is closely related to extensibility as extensible languages may allow different versions of instances than those known by the language designer. Applications may receive versions of a language that they aren't expecting. If a Name Language V2 exists, with its set of strings and Information set, Wilma may consume the same Name Instance but with respect to the Name Language V2 and have impact of Information 2. Name Language V2 relates to V1 by relationship r2, which is forwards compatible comparing language V1 to V2 instances, and backwards compatible comparing language V2 to V1 instances. Similarly, Information 2 - as conveyed by Consumption 2 - relates to Information 1 - as conveyed by Consumption 1 - by relationship r1. Extensibility is a property that enables evolvability of software. It is perhaps the biggest contributor to loose coupling in systems as it enables the independent and potentially compatible evolution of languages. Languages are defined to be [Definition: Extensible if the syntax of a language allows information that is not defined in the current version of the language.]. The Name Language is extensible if it can include terms that aren't defined in the language, like a new middle term. As languages evolve, it is possible to speak of backwards and forwards compatibility. A language change is backwards compatible if newer processors can process all instances of the old language. Backwards compatibility means that a newer version of a consumer can be rolled out in a way that does not break existing producers. A producer can send an older version of a message to a consumer that understands the new version and still have the message successfully processed. A software example is a word processor at version 5 being able to read and process version 4 documents. A schema example is a schema at version 5 being able to validate version 4 documents. This means that a producer can send an old version of a message to a consumer that understands the new version and still have the message successfully processed. In the case of Web services, this means that new Web services consumers, ones designed for the new version, will be able to process all instances of the old language. A language change is forwards compatible if older processors can process all instances of the newer language. Forwards compatibility means that a newer version of a producer can be deployed in a way that does not break existing consumers. Of course the older consumer will not implement any new behavior, but a producer can send a newer version of an instance and still have the instance successfully processed. An example is a word processing software at version 4 being able to read and process version 5 documents. 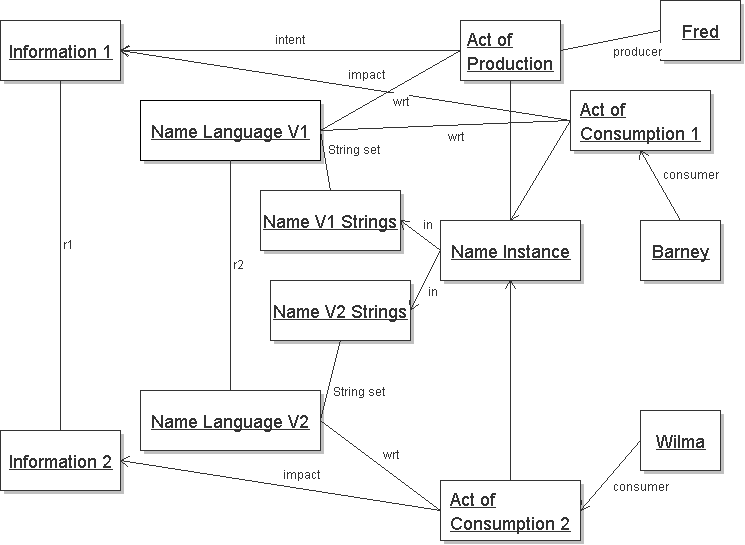 A schema example is a schema at version 4 being able to validate version 5 documents. This means that a producer can send a newer version of a message to an existing consumer and still have the message successfully processed. In the case of Web services, this means that existing Web service consumers, designed for a previous version of the language, will be able to process all instances of the new language. With respect to consumers and producers, backwards compatibility means that newer consumers can continue to use existing producers, and forwards compatibility means that existing consumers can be used by newer producers. We need to be more precise in our definitions of what parts of our definitions are compatible with what other parts. Every language has a Defined Text set, which contains only Texts that contain the texts explicitly defined by the language constraints. Typically, a language will define a mapping from each of the definitions to information. Each language has an Accept Text set, which contains texts that are allowed by the language constraints. Typically, the Accept Text set contains Texts that are not in the Accept Text set and do not have a mapping to information. For example, a language that has a syntax that says names consists of given followed by family followed by anything. A text that consists of a name with only a given and a family falls in the Defined and Accept Text set. A text that consists of a name with a given, a family and an extension such as a middle falls in the Accept Text set but not the Defined text set. By definition, the Accept Text set is a superset of the Defined Text set. We have discussed backwards and forwards compatibility in general, but there other flavours of compatibility, based upon compatibility between the Accept Text set, Defined Text set and Information conveyed. Syntactic compatibility is compatibility that is wrt the Texts only, not the information conveyed. Because languages have Accept and Defined Text sets, some producers will adhere to the Defined Text set, and others may generate extensions that fall in the Accept Text set. Compatibility with Producers that produce only Defined Text sets is called "strict" compatibility. Compatibility with Producers that may produce Texts in the Accept Text Set that are not in the Defined Text Set is called "full" compatibility. A more precise definition of compatibility is with respect to the texts, that is whether all the texts in one language are also texts in another language. Another precise form of compatibility is with respect to the information conveyed, that is whether the information conveyed by a text in one language is conveyed by the same text interpreted in another language. The texts could be compatible but the information conveyed is not compatible. For example, the same text could mean different and incompatible things in the different language. Most systems have different layers of software, each of which can view a text differently and affect compatibility. For example, the XML Schema PSVI view is different from the actual text. We can also differentiate between language compatibility and application compatibility. While it is often the case that they are directly related, sometimes they are not, that is 2 languages may be compatible but an application might be incompatible with one of them. We provide mathematical definitions of a text's compatibility based up on our terminology. Let L1 and L2 be Languages, where L2 is introduced "after" L1. Let T be a text. T is in L1 iff (T is valid per L1 | T is in L1's set of Texts). Let I1 be the information conveyed by Text T1 per language L1. Let I2 be the information conveyed by Text T per language L2. Text T is "fully compatible" with language L2 if and only if I1 is compatible with I2 and (T is valid per L2 | T is in L2's set of Texts). Text T is incompatible if any of the information in I2 is wrong (I.e. replaces a value in I1 with a different one) | (T is invalid per L2 | T is not in L2's set of Texts). L2 is "fully backwards compatible" with L1 if every text in L1 Accept Text set is fully compatible with L2. L2 is "strictly backwards compatible" with L1 if every text in L1 Defined Text set is fully compatible with L2. L2 is "strictly backwards incompatible" with L1 if any text in L1 Defined Text set is incompatible with L2. L1 is "fully forwards compatible" with L2 if every text in L2 Accept Text set is fully compatible with L1. L1 is "strictly forwards compatible" with L2 if every text in L2 Defined Text set is fully compatible with L1. L1 is "forwards incompatible with L2" if any text in L2 is incompatible with L1. And combined together is: L1 is strictly compatible with L2 if if every text in L2 Defined Text set is fully compatible with L1 AND if every text in L1 Defined Text set is fully compatible with L2. We can draw a few conclusions. Given L2 is strictly backwards incompatible with L1 if any text in L1 Defined Text set is incompatible with L2, the only way that L2 can be backwards compatible with L1 is if the L2 Defined Text Set is a superset of L1 Defined Text set. Roughly, that means the addition of optional items in L2. Given L1 is "fully forwards compatible" with L2 if every text in L2 Accept Text set is fully compatible with L1, the only way that L1 can be forwards compatible with L2 is if the L1 Accept Text is is a superset of the L2 Accept Text set. Roughly, that means L1 allows all of L2 and more. It is this superset relationship that is a key to forwards compatibility, the allowing of texts by L1 that will become defined in L2. Compatibility can be restated in terms of superset/subset relationships. Language L2 is strictly backwards compatible with Language L1 if L2 Defined Text set > (superset) L1 Defined Text Set AND every text in L1 Defined Text set is compatible with L2. Language L1 is strictly forwards compatible with Language L2 if L1 Accept Text set > (superset) Language L2 Accept Text set AND every text in L2 Accept Text set is compatible with L1. Language L2 is fully strictly compatible with Language L1 if L1 Accept Text set > (superset) Language L2 Accept Text set > (superset) L2 Defined Text set > (superset) L1 Defined Text Set AND every text in L1 Defined Text set is compatible with L2 AND every text in L2 Accept Text set is compatible with L1. We have shown that forwards and backwards compatibility is only achievable through extensibility, and compatible versioning is a process of gradually increasing the Defined Text Set, reducing the Accept Text Set and ensuring the information conveyed is compatible, If ever the set relationships defined earlier do not hold, then the versions are not compatible. We have defined compatibility for all possible expressions of the language, that is full compatibility. There are many scenarios where a consumer will consume only part of the information set. Partial understanding affects the Text set and the Information conveyed. Partial understanding usually results in a subset of the information (because only part of the information is understand). Interestingly, partial understanding is an increases or supersets the Accept Text Set and a parallel decrease or subset of the Defined Text Set. This is because the process of extracting a part of the text means that extra content, even those illegal under V1 syntax, becomes part of the Accept Text Set. We can imagine an application that only looks at given names and everything else is ignored. My favourite example of this is a "Baby Name" Wizard. The application might use a simple XPath expression to extract the given name from inside the name. This is a different version of the Name Language, which we will call the Given Name Language. The Accept Text set for the Given Name Language is anything, given, anything. The Defined Text set for the Given Name Language is given. The information set for the Given Name language is given. Because the Given Name Language syntax set is more relaxed that the Name Language V1, an addition of the middle name between the given and family is a compatible change for the Given Name Language. There are a variety of other now acceptable names in the Given Name Language. Our principles with respect to compatibility and language versioning need no change to deal with partial understanding. Partial understanding a language is the creation of Language L1' that is compatible with Language L1. This is true if L1' Accept Text set > (superset) Language L1 Accept Text set > (superset) L1 Defined Text set > (superset) L1' Defined Text Set AND every text in L1' Defined Text set is compatible with L1 AND every text in L1' Accept Text set is compatible with L1'. Interestingly, partially understanding a language is creating a language V1', such that the V1 language is a compatible change with the V1'. There may be many different versions that are all partial understandings of a language. We call these related languages "flavours". It may be very difficult for a language designer to know how many different language flavours are in existence. However, a language designer can sometimes use the different flavours to their advantage in designing for a mixture of compatible and incompatible changes. Some changes could be compatible with some flavours but not other. It may be very useful to have some changes be compatible with some flavours, that is those consumers do not need to be updated or changed. It is crucial to point out that the consumers of partially understood versions of the language are not also producers of the partially understood language. They have relaxed the restrictions on the consuming side, but should not do so on the production side of the language. If a flavour of a language was also used for production, it should have to create an instance that is valid according to the Language V1 rules, not the Language V1'. Perhaps the only exceptions are if they are guaranteed that they will be producing for compatible flavours. Typically this is not the case and hard to determine, so the safest course is to produce according to the Language V1 rules. We have shown how relaxing the constraints on a language when consuming instances of it can turn an otherwise incompatible change into a compatible change. We have also shown that abiding by the language constraints when producing instances is the safest course. Said more eloquently is the internet robustness principle, "be conservative in what you do, be liberal in what you accept from others" from [tcp]. Use Least Partial Languages for "liberal" versioning: Consumers should use a flavour of a language that has the least amount of understanding. The least amount of understanding will be the most liberal or have the largest syntax set possible. The "liberal" style of versioning has a significant downside in that it can lead to very fragile and hard to evolve software because the "liberal"ness is difficult to code and it does not force producers to be correct in what they produce, causing a vicious cycle of complexity. Use No Partial Languages for "conservative" versioning: Consumers should fully use and validate a language. The fullest amount of understanding will find the most errors. Produce no partial languages: Producers should use the complete version of a language and no partial flavours of a language. However, the difference between them is that "liberal" consumers might allow producers that aren't fully compatible with the Language whereas "conservative" consumers will be less fault tolerant. EdNote: I think related to principle of least power. The least powerful the language, the easier to have partial understanding? EdNote: I think there is a relationship between conservative/liberal and description. Perhaps there is problem when a text is treated as being in the language even when the description doesn't allow it. So the producer has "drifted" away from the documentation, and a conservative consumer will fault and a liberal consumer will pass. Compatibility is defined for the producer and consumer of an individual text. Most messaging specifications, such as Web Services, provide inputs and outputs. Using these definitions of compatibility, a Web service that updates its output message is considered a newer producer because it is sending a newer version of the message. Conversely, updating the input message makes the service a newer consumer because it is consuming a newer version of the message. All systems of inputs and outputs must consider both when making changes and determining compatibility. For full compatibility, any output messages changes must be forwards compatible (for the older receivers aka consumers) and any input message changes must be backwards compatible (for the older senders aka producers). The cost of changes that are not backward or forward compatible is often very high. All the software that uses the language must be updated to the newer version. The magnitude of that cost is directly related to whether the system in question is open or closed. [Definition: A closed system is one in which all of the producers and consumers are more-or-less tightly connected and under the control of a single organization.] Closed systems can often provide integrity constraints across the entire system. A traditional database is a good example of a closed system: all of the database schemas are known at once, all of the tables are known to conform to the appropriate schema, and all of the elements in the each row are known to be valid for the schema to which the table conforms. From a versioning perspective, it might be practical in a closed system to say that a new version of a particular language is being introduced into the system at such and such a time and all of the data that conforms to the previous version of the schema will be migrated to the new schema. In an open system, it's simply not practical to handle language evolution with universal, simultaneous, atomic upgrades to all of the affected software components. Existing producers and receivers outside the immediate control of the organization that has publishing a changed language will continue to use the previous version for some (possibly long) period of time. Finally, it's important to remember that systems evolve over time and have different requirements at different stages in their life cycle. During development, when the first version of a language is under active development, it may be valuable to pursue a much more aggressive, draconian versioning strategy. After a system is in production and there is an expectation of stability in the language, it may be necessary to proceed with more caution. Being prepared to move forward in a backwards and forwards compatible manner is the strongest argument for worrying about versioning at the very beginning of a project. As texts, or messages, are exchanged between applications, they are processed. Most applications are designed to discriminate between valid and invalid inputs. In order to have any sort of interoperability, a language must be defined or described in some normative way so that the terms "invalid" and "valid" have meaning. There are a variety of tools that might be employed for this purpose (DTDs, W3C XML Schema, RELAX NG, Schematron, etc.). These tools might be augmented with normative prose documentation or even some application-specific validation logic. In many cases, the schema language is the only validation logic that is available. It is almost unheard of for a single version of a language to be deployed without requiring some kind of augmentation. Invariably, the original language designer did not include certain terms and constraints. In fact, good designers should not try to define all the possible terms and constraints. This is sometimes called "boiling the ocean". Knowing that a language will not be all things to all people, a language designer can allow parties to extend instances of the language or the language itself. Typically the tools will allow the language designer to specify where extensions in the instance and extensions in the language are allowed. Of note, we do not call extending a text of a language a new version. This limits our discussion of versioning to changes in a language, not changes to instances. Whether you've deployed ten resources, or a hundred, or a million, if you change a language in such a way that all those resources will consider instances of the new language invalid, you've introduced a versioning problem with real costs. Once a language is used outside of its development environment, there will be some cost associated with changing it: software, user expectations, and documentation may have to be updated to accommodate the change. Once a language is used in environments outside of a single realm of control, any changes made will introduce multiple versions of the language. Bugs may need to be fixed. Production use may reveal defects or oversights that need to be fixed. This may involve changes to components of the language or changes to the semantics of existing components. Changing requirements may motivate changes in the schema design. For example, a callback may be added to a service that performs some processing so that it is able to notify the caller when processing has completed. Different flavors of a schema may be desirable. For example, the XHTML 1.0 Recommendation defines strict, transitional, and frameset schemas. All three of those schemas purport to define the same namespace, but they describe very different languages. And additional schemas may be defined by other specifications, such as the XHTML Basic Recommendation. Whatever the cause, over time, different versions of the language exist and designing applications to deal with this change in a predictable, useful way requires a versioning strategy. ElementsNew elements can be added, existing elements can be removed, or the acceptable number of occurrences of an element can change. In addition, the content of an element could change from element only content to mixed content, or vice versa. For elements with simple content, the type or range of values that are acceptable can change. Attributes: New attributes can be added, existing attributes can be removed, or the type or range of values that are acceptable can change. Semantics: The meaning of an existing term can change. Of course, the difference between two versions of a language can be an arbitrary number of these changes. One of the most important aspects of a change is whether or not it is backwards or forwards compatible. The primary motivation to allow instances of a language to be extended is to decentralize the task of designing, maintaining, and implementing extensions. It allows producers to change the instances without going through a centralized authority. It means that changes can occur at the producer or consumer without the language owner approving of them. Consider the effort that the HTML Working Group put into modularity of HTML. Without some decentralized process for extension, every single variant of HTML would have to be called something else or the HTML Working Group would have to agree to include it in the next revision of HTML. Just Names: some languages don't actually have a syntax or grammar; they're just lists of names. Using names to identify words in the WordNet database, for example, or the names of functions and operators in XPath2 are examples of "just name" languages. Non-markup Text: languages designed with a text format. These may be programming languages such as Java or ECMAScript, or data formats like CSS or Comma Separated Values. Typically these are intended for humans to author and or view. binary: languages that are not in a text format. These may be image formats like GIF, JPEG, or even binary encoded XML. This is by no means an exhaustive list. Nor are these categories exclusive. Many languages have mixed modes. For example, XQuery has a text mode and an XML mode. Versioning is a broad and complex issue. Different communities have different notions about what constitutes a version, what constitutes a reasonable policy, and what the appropriate behavior is in the face of deviations from that policy. Historically, it has always proved more complicated in practice than in theory. None. No distinction is made between versions of the language. Applications are either expected not to care, or they are expected to cope with any version they encounter. Compatible. Designers are expected to limit changes to those that are either backwards or forwards compatible, or both. Backwards compatibility. Applications are expected to behave properly if they receive a text of the "older" version of a language. Backwards compatible changes allow applications to behave properly if they receive a text of the "older" version of the language. Forwards compatibility. Applications are expected to behave properly if they receive a text of the "newer" version of a language. Forwards compatible changes allow existing applications to behave properly if they receive a text of the "newer" version of the language. Flavors. Applications are expected to behave properly if they receive one of a set of flavors of the text type. Big bang. Applications are expected to abort if they see an unexpected version. There's no single approach that's always correct. Different application domains will choose different approaches. But by the same token, the approaches that are available depend on other choices, especially with respect to namespaces. This dependency makes it imperative to plan for versioning from the start. If you don't plan for versioning from the start, when you do decide to adopt a plan for versioning, you may be constrained in the available approaches by decisions that you've already made. Just as there are a number of approaches, there are a number of strategies for implementing an approach. The internet - including MIME, markup languages, and XML languages have successfully used various strategies, either singly or in combination. Summaries of strategies and requirements have been produced for earlier technologies and guided XML Namespaces and Schema, such as [Web Architecture: Extensible Languages]. Must Understand All: consumers must understand all of the text received and are expected to abort processing if they do not. Must Understand Listed: consumers must understand the text portions that are listed in some well-defined place in the text. Must Understand Marked: consumers must understand the text portions that are marked as being mandatory. SOAP Header Blocks with the mustUnderstand attribute is an example. Provide Processing Model Rule: Languages SHOULD specify a processing model for dealing with extensions. Achieving forwards-compatible evolution requires that the processing model must be a substitution mechanism. The instance containing the extension, which isn't known by the consumer, must be transformed into an instance which is of a type known by the consumer. Provide Substitution model: Languages MUST provide a substitution model for forwards-compatible evolution. Must Ignore Unknowns Rule: Consumers MUST ignore any text portion that they do not recognize. Sometimes the must understand and must ignore approaches can be combined for more selective use. SOAP processors must ignore headers they do not recognize unless the header explicitly identifies itself as one that must be understood. Must Ignore All Rule: The Must Ignore rule applies to unrecognized elements and their descendents in data-oriented formats. This variation on must ignore requires the consumer to ignore the text and any children it does not understand. Most data applications, such as Web services that use SOAP header blocks or WSDL extensions, adopt this approach to dealing with unexpected markup. For XML, the Must Ignore all rule was first standardized in the WebDAV specification RFC 2518 [WebDAV] section 14 and later separately published as the [FlexXMLP]. For example, if a message is received with unrecognized elements in a SOAP header block, they must be ignored unless marked as "Must Understand" (see Rule 10 below). Note that this rule is not broken if the unrecognized elements are written to a log file. That is, "ignored" doesn’t mean that unrecognized extensions can’t be processed; only that they can’t be the grounds for failure to process. Must Ignore Container Rule: The Must Ignore rule applies only to unrecognized elements in presentation-oriented formats. This retains the element descendents in the processing model so that they can still affect interpretation of the text, such as for display purposes. Ignoring content is a simple solution to the problem of substitution. In order to achieve a compatible evolution, the newer instances of a language must be transformable (or substitutable) into older instances. Object systems typically call this "polymorphism", where a new type can behave as the old type. A language can provide mechanisms for explicit fallback if the text is not supported. [MIME] provides multipart/alternative for equivalent, and hence fallback, representations of content. [HTML 4.0] uses this approach in the NOFRAMES element. In XML, the XML Inclusions specification [XInclude] provides a fallback element to handle the case where the putatively included resource cannot be retreived. There are many variations on where the fallback content can be found. For example, a schema language could specify that fallback content is found in a text, in a schema, or even in the schema for the schema language. Additional functionality can be provided in a language for determining the capabilities of the system that the text is being interpreted in. A language can provide a mechanism for explicit testing. The XSLT Specification provides a conditional logic element and a function to test for the existence of extension functions. This allows designers of stylesheets to deal with different consumer capabilities in an explicit fashion. In general, providing backwards compatibility is easier than providing forwards compatibility. Backwards compatibility means supporting the previous versions of text in a newer consumer. There are are two significant ways that backward compatibility can be supported. In the replacement design, the new version of software replaces the old and the new version of the software supports the old and the new version. That is, producer does not need to distinguish between the old and the newer consumer. For example, a web resource that supports additional Name Information as input does not change the URI of the resource. In the side-by-side design, the new version of the software and the old version of the software are deployed "side-by-side". One variant is offering both versions of the system, for example by using different URIs for the old and new resources. The request to one resource gets mapped to the other resource behind the scenes using a proxy or gateway. This "alternative" approach works when the intermediary can completely handle or generate the new information (for backwards compatibility) or ignore the new information (for forwards compatibility). For example, adding SSL security to a resource changes the URI but a Web server can typically handle mapping the https: URI to the older http: URI. If both URIs are maintained, then the addition is a compatible change. Another example is where new information is required, such as the priority, and the intermediary can apply a default value to provide the required priority. However, this too has its costs as multiple versions of the software must be supported and maintained over time and there is the added cost of developing the proxy or gateway between the two environments. Further, this does not work in scenarios where the intermediary cannot generate the new required content. For example, if a middle name is required in V2, a middle cannot be generated from just a family and a given name. Languages can choose a mixture of approaches. For example, XSLT provides both an explicit fallback mechanism for some conditions and explicit testing for others. The SOAP specification, another example, specifies Must Ignore as the default strategy and the ability to dynamically mark components as being in the Must Understand strategy. Different kinds of languages and different versioning strategies expose different problems. If you don't have a strategy at all, you are effectively choosing the "no versioning" strategy. It's probably obvious that attempting to deploy a system that provides no versioning mechanism is fraught with peril. Putting the burden of version "discovery" on consumers is probably impractical in anything except a closed system. At the other end of the spectrum is the "big bang" approach which is also problematic. "Big bang" is a very coarse-grained approach to versioning. It establishes a single version identifier, either a version number or namespace name, for an entire text. The semantics of the "big bang" are that applications decide on the basis of the text version whether or not they know how to process that text. If the version isn't recognized, the entire text is rejected. Typically, when introducing a new version using the big bang approach, all of the software that produces or consumes the texts is updated in a sweeping overhaul in which the entire system is brought down, the new software deployed and the system is restarted. This big bang approach to versioning is practical only in circumstances where there is a single controlling authority, and even in that case, it carries with it all manner of problems. The process can take a considerable amount of time, leaving the system out of commission for hours if not days. This can result in significant losses if the system is a key component of a revenue generating business process and the cost of coordinating the system overhaul can also be quite costly as well. The "big bang" approach is appropriate when the new version is radically different from its predecessor. But in many cases, the changes are incremental and often a consumer could, in practice, cope with the new version. For example, it might be that there are many messages that don't use any features of the new version or perhaps it is appropriate to simply ignore elements that are not recognized. For example, consider two resources exchanging messages. Imagine that some future version of the language that they are using defines a new "priority" element. Because producers and consumers are distributed, it may happen that an old consumer, one unprepared for a priority element, encounters a message sent by a newer producer. If big bang versioning is used, old systems will reject the new message. However, if the versioning strategy allowed the old consumer to simply ignore unrecognized content, it's quite possible that other components of the system could simply adapt to the previous behavior. In effect, the old system would ignore the priority element and its descendents so it would "see" a message that looks just like the old format it is expecting. For the producer, the result would be that the request is fulfilled, though perhaps in a more or less timely fashion than expected. In many cases this may be better behavior than receiving an error. In particular, producers using the new format can be written to cope with the possibility that they will be speaking to old consumers. If the new system needs to make sure that priority is respected, then it can change the purchase order's name or namespace to indicate that the new behavior is not considered backwards compatible. Often, what is needed is some sort of middle ground solution. An evolving system should be designed with backwards and forwards compatibility in mind. Given the types of versioning strategies and designs that are available, what requirements must the language designer consider in choosing a strategy and design? Languages can be expressed in text, comma separated values, XML, SGML, binary, source code, and almost any kind of form. See the Architecture of the World-Wide Web section on data formats for more information - http://www.w3.org/TR/2004/REC-webarch-20041215/#formats. It is sometimes desirable to prevent 3rd parties from extending languages, but it does happen. An example may be a tightly constrained security environment where distributed authoring is considered a "bug" rather than a feature. If so, a substitution mechanism is required for forwards compatibility. If an older consumer has no mechanism for dealing with new content, then forwards-compatible evolution isn't possible. One simple substitution mechanism is simply ignoring the unrecognized components. If so, and if compatible extensions are also possible, then it must be possible to identify incompatible changes so that they can override the substitution mechanism used for extensible changes. In environments where unrecognized components are ignored, a "must understand" component can be added to identify incompatible changes. If compatible changes are not possible, then incompatible changes simply become the default. For example, WS-Security mandates that 3rd parties can only provide incompatible extensions. Unlike most languages, a security language has unique requirements where the consequences of ignored data can be severe. WS-Security accomplished this by specifying that all extensions are required to be understood and there is no substitution mechanism. As with 3rd parties compatible extensions, a substitution mechanism for the designer’s extensions is required for forwards compatibility. In XML, the designer can always do this by using new namespace names, element names or version numbers. In other languages, this may not be possible because there is no mechanism for indicating the incompatible change. A part of this question is whether the language depends on another language. That determines which, if any, facilities are provided for the containing language and what must be provided by a contained language. SOAP is an example of a container language. The SOAP processing model applies uniformly to all headers, which may employ soap:mustUnderstand to identify incompatible changes, even though the contents of the SOAP headers are languages independent from SOAP. Choosing a schema language or languages guides the language design in many ways. Some features, particularly extensibility, must be anticipated in the first version of a language in order to take advantage of the features of some schema languages. In addition, various features may be incompatible across different languages. For example, writing a V2 compatible schema in W3C XML Schema requires special design, which is not required in a schema language such as RELAX NG. Some of the language design choices mandated by W3C XML Schema are discussed in other sections of this Finding. The ability to write a schema for extensions or versions is directly affected by the schema design and the compatibility desires. If the language is intended to be capable of compatible extensibility, then a few specific schema design choices must be followed. Forwards compatibility can only be achieved by providing a substitution mechanism for Version 2 instances or Version 1 extensions to V1 without knowledge of V2. A V1 consumer must be able to transform any instances, such as V1 + extensions, to a V1 instance in order to process the instance. The "Must Ignore unknown" rule is a simple substitution mechanism. This rule says that any extensions are "ignored". Using it, a V1 + extensions text is transformed into a V1 text by ignoring the extensions. Others substitution mechanisms exist, such as the fallback model in XSLT. The identification of components into language versions or extensions has a variety of general mechanisms related to namespaces. These are detailed in the Versioning section. The identification of versions is covered by language identification, but 3rd parties cannot arbitrarily change versions or change namespaces. They may need a mechanism to indicate that an extension is an incompatible change. A couple of mechanisms are a "Must Understand" identifier (such as a flag or list of required namespaces) or requiring that extensions are in substitution groups. A supreme example of the benefits of extensibility is HTML. The first version of HTML was designed for extensibility; it said that "unknown markup" may be encountered. An example of this in action is the addition of the IMG tag by the Mosaic browser team. This is a great example of a language designed for extensibility. Compatible Versioning rule: Any Language intended for compatible versioning MUST have extensibility. A fundamental requirement for extensibiliy and versioning is to be able to determine the language Texts and sub-texts. Any language that does not allow identification of the language will probably have a more difficult time being versioned. Having multiple versions naturally leads to the need to identify versions. Version identification has traditionally been done with a decimal separating the major versions from the minor versions, ie "8.1", "1.0". Often the definition of a "major" change is that it is incompatible, and the definition of a "minor" change is that it is forwards- and/or backwards - compatible. Usually the first broadly available version starts at "1.0". A compatible version change from 1.0 might be identified as "1.1" and an incompatible change as "2.0". It should be noted that associating version number changes with compatibility changes may be idealistic as there abundant cases where this system does not hold. New major version identifiers are often aligned with product releases, or incompatible changes identified as a "minor" change. A good example of an incompatible changed identified as a minor change is XML 1.1. XML 1.0 processors cannot process all XML 1.1 documents because XML 1.1 extended XML 1.0 where XML 1.0 does not allow such extension. Unfortunately, version numbers often wind up looking very similar to the big bang approach. In many approaches, each language is given a version identifier, almost always a number, that's incremented each time the language changes. Although it's possible to design a system with version numbers that enables both backward and forward compatibility - for example XSLT - typically a version change is treated as if that the new language is not backwards compatible with the old language. Some efforts, such as HTTP, try to have the best of both worlds by allowing for extensibility (in HTTP's case, via headers) as well as version numbers that explicitly identify when a new version is backwards compatible with an old version. One argument in favor of version numbers is that they allow one to determine what is a 'new version' and what is an 'old version'. But in practice this is not necessarily true. For example, RSS has 0.9x, 1.x, and 2.x versions, all being actively developed in parallel. In effect the version numbers, even though they appear to be ordered, are simply opaque identifiers. Using version numbers does not gaurantee that version 1+x has any particular relationship to version 1. Version numbers typically work best when versioning and extending a language is done in a centralized and linear manner. The makeup of each version can then be consistent and well described. There are many cases where decentralized and non-linear versioning is desired. The desire for decentralized and non-linear versioning and extensibility was a large motivator for XML and for XML Namespaces. The self-describing and extensible nature of XML markup, and the addition of XML Namespaces, provides a framework for developing languages that can evolve in a decentralized manner. XML Namespaces [ XML Namespaces 1.0] provide a mechanism for associating a URI with an XML element or attribute name, thus specifying the language of the name. This also serves to prevent name collisions. The usage of namespace names for identifying components has led to the interesting situation where the distinction between an extension and a version can be quite blurred, depending upon the language designer’s choices. One rough way of thinking of these two concepts is that extension is typically the addition of components over space; that is, designers other than the language’s creator are adding components. Versioning is typically the addition of components over time, under the designer’s explicit control. In either case, a change to the language may be done in a compatible or an incompatible way. The simple cases of extensions are compatible decentralized additions and versions are compatible or incompatible centralized changes are how we typically distinguish the terms. But these break down depending upon how the language is designed. There are a couple of scenarios that illustrate the ambiguity in these terms. Imagine that version 1.0 of a Name consists of "First" and "Last" elements. A 3rd party author extends the Name with a "middle" element in a new namespace which they control. In scenario 1, the Name author decides to formally incorporate the middle name as an optional (and hence compatible) addition to the name, producing version 1.1 of the Name type. They do this by referring to the third party’s definition and namespace for middle names. This is typically considered a new "version" of the Name and would probably result in a new schema definition. If the Name author re-uses namespace names for compatible revisions, there will be no difference in a text containing middle that is of Version 1.0 or Version 1.1 type. The texts are the same, and thus the distinction between a "version" and an "extension" is meaningless for an individual text. In scenario 2, the middle author decides that the middle name is a mandatory part of the Name type. They were provided a mechanism for indicating an incompatible change and they use it. Now an instance of Name with the middle is incompatible with version 1.0 of the Name. What "version" of the Name is this middle, and is the middle an "extension" or a "version"? It isn’t 1.0. It’s probably more accurately thought of as a version defined by the 3rd party. Again, the presence of the "extension" is actually an incompatible change. These two examples—a 3rd party extension being added into a compatible version and a 3rd party extension resulting in an incompatible version—show the ability to specify (in)compatibility has blurred the distinction between these two terms. This Finding is intended to motivate language designers to plan for versioning and extensibility in the languages from the very first version. It details the downsides of ignoring versioning. To help the language designer provide versioning in their language, the finding describes a number of questions, decisions and rules for using XML, XML Namespaces and schema languages in XML language construction and extension. The main goal of the set of rules is to allow language designers to know their options for language design, and ideally make backwards- and forwards-compatible changes to their languages to achieve loose coupling between systems. The author thanks Norm Walsh for many contributions as co-editor until 2005. Also thanks the many reviewers that have contributed to the article, particularly David Bau, William Cox, Ed Dumbill, Chris Ferris, Yaron Goland, Hal Lockhart, Mark Nottingham, Jeffrey Schlimmer, Cliff Schmidt, and Norman Walsh.